40 • WRAPS • 2 0 1 8 E mbossing and debossing is the processes of creating ei- ther raised or recessed relief images and designs in pa- per and other materials. In this case with self-adhesive vinyl. A high-quality vector art le is a good starting point to create your desired emboss graphics. 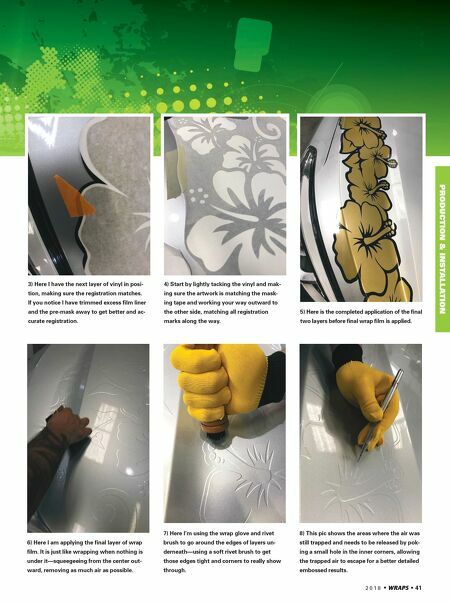 For this project we will be embossing some interesting ow- er patterns on the hood and side mirrors on a silver vehicle with a nish silver lm layer for a paint-like embossed style. To make it fun, we will be doing mirrors in one layer and the hood in two layers. We will be using a ower pattern style vector le to be cut with a plotter. After le is sized correctly and plotted we will be pre-masking it as we would with any other standard decal, making it ready to install. 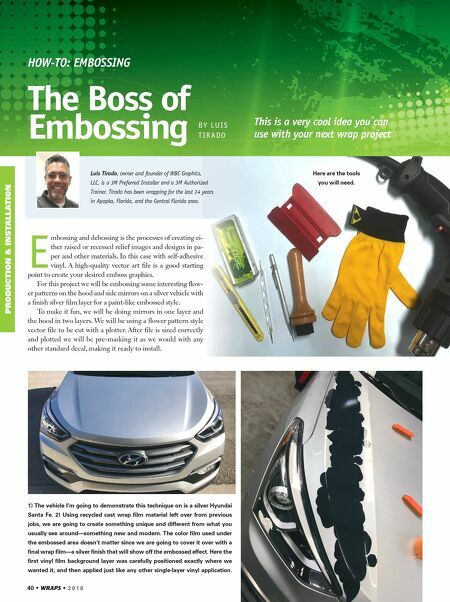 HOW-TO: EMBOSSING The Boss of Embossing This is a very cool idea you can use with your next wrap project Luis Tirado, owner and founder of WBC Graphics, LLC, is a 3M Preferred Installer and a 3M Authorized Trainer. Tirado has been wrapping for the last 14 years in Apopka, Florida, and the Central Florida area. PRODUCTION & INSTALLATION BY L U IS T I R A D O Here are the tools you will need. 1) The vehicle I'm going to demonstrate this technique on is a silver Hyundai Santa Fe. 2) Using recycled cast wrap film material left over from previous jobs, we are going to create something unique and different from what you usually see around—something new and modern. The color film used under the embossed area doesn't matter since we are going to cover it over with a final wrap film—a silver finish that will show off the embossed effect. Here the first vinyl film background layer was carefully positioned exactly where we wanted it, and then applied just like any other single-layer vinyl application.